A city fire department relied more on the memories of its firefighters than it did on its alarm system. The department had a fire alarm board that was hard-wired to 80 area buildings — but its effectiveness was seriously limited. While the panel was capable of reporting whether any of those buildings had devices in trouble or alarm, it was still up to the fire chief and the firefighters to determine what the problem might be. Typically, the seasoned fire chief would see the panel light up and simply guess, “That’s Jones, burning toast again.” The panel offered no information about any of the facilities’ locations or floor plans. Firefighters knew where most of the buildings were, and at least one firefighter inspected each structure once a year. But the maps and blueprints the department had on hand were often nothing more than hastily drawn sketches on yellow note paper, all stuffed into a metal file cabinet in the chief’s office. To make matters worse, the board was maxed out, operating at full capacity. A half-dozen new stores and office buildings had been constructed in recent months, but they couldn’t connect their alarm systems to the fire department. Instead, their alarms were routed to the county’s 911 dispatch center, five blocks from the fire department. And if that weren’t bad enough, the fire department’s board was more than 30 years old. Spare parts were no longer available. After decades of tinkering, homemade repairs, and cobbled-together additions, it was only a matter of time before the board would burn out, and the department would have no alarm system in place. 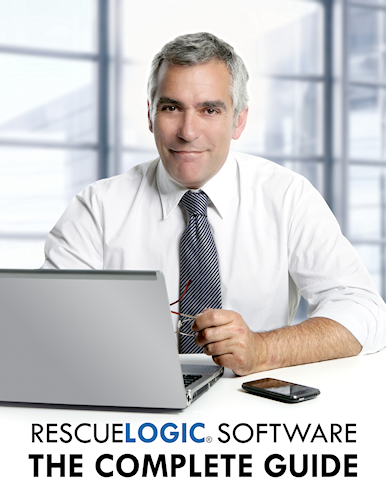 Thanks to RescueLogic, the firefighters were able to rescue their dangerously outdated alarm system. Wayne was the fire department’s resident computer expert. 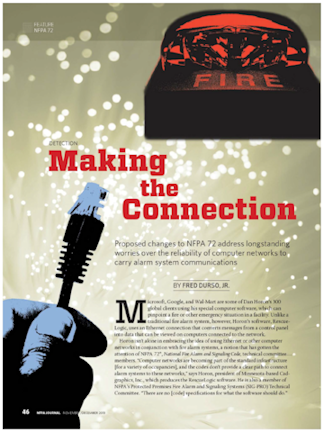 He installed the software on the department’s existing PC, and he used inexpensive networking components to connect the fire department’s alarm board to the RescueLogic computer. He worked with city administrators to mount an antenna on top of the city’s water tower, and instructed the owners of the city’s newest buildings to install their own wireless network adaptors to their alarm panels and transmit through the antenna to the fire department. Wayne could have stopped there. He had extended the life of the existing alarm board, by using RescueLogic as a backup monitoring station. He also had expanded the functionality of the system, by making it possible for new buildings to report alarms directly to the station. The other firefighters were impressed — but they soon learned that Wayne had even bigger plans for the RescueLogic system. Wayne got a copy of a city map from the city assessor’s office. It was a CAD file, complete with street names, addresses, property lines, and even fire hydrants. Wayne imported the CAD file into the RescueLogic computer, and between emergency calls he set about populating the map with the locations of all of the buildings that had alarm systems. First, he set up the RescueLogic system so that those locations would blink whenever an alarm came in from any of the buildings. Then he started importing floor plans and blue print files for each location. If building owners didn’t have existing maps and floor plans for their facilities, Wayne created them with inexpensive CAD software — a process that quickly became second nature, and took about 10 minutes for each building. Wayne asked his colleague Jeff to take digital photos of each building, and then he added those photos to the database, as well. At that point, firefighters could click on any building on the map and immediately access photos and floor plans of each facility. They could see entrances and exits, the location of extinguishers, sprinklers, and hoses, and the presence of any hazardous materials on site. As Wayne continued to customize the RescueLogic system, he added notes to the database, so firefighters would know where the department had keys on file for each building on the map. He also added other notes and comments to the database, including records of previous emergency calls and information about vulnerable people who lived or worked in each building. Wayne wasn’t done yet. Some of the older buildings in town didn’t have alarm systems, so Wayne simply linked the location of each structure to their locations on the map. But the best was yet to come. Because Wayne had already set up a wireless hub at the fire alarm panel, he was able to expand the department’s network and add RescueLogic to wireless laptops and tablet PCs in the chief’s vehicle and the fire engines. Suddenly, firefighters could access information about alarms while they were still en route to a call. Over time, Wayne added everything that the chief and the experienced firefighters had been carrying in their heads, instantly accessible to even the newest recruit. And while their memories were still an important component of their fire safety program, they now had a much more reliable tool at their disposal.